For several years, I've found an insane level of amusement via the use of a certain translation website. Specifically, I've found that if I put the words to a song (something complicated, or one which tells a story usually works best) into the translation device, and ask for a translation in German, then put that German translation back into the device and ask for French, then go to Italian, to Spanish, back to Italian, to French, to German, and back to English, the results can be hysterical. Well, the Saturday absorbed on a night the Sunday! Thinking, that everything remained in the order. And I it opened carries she. The whole youth age had the dancing bug. Molly then with a Peggy Son there, also a court there! I went, and I put on well my dancing shoes! Anyway, what I've just uploaded is a recording made of me reading a translation of "The Night Before Christmas", prepared in this way, with plenty of laughter, both in response, and from me, given that I had not thought to re-read the document just before giving this performance (resulting in my having forgotten the funniest parts, and laughing at them again. Hope you find this enjoyable. Wow - Two months without a post. Well, I do hope things are about to settle down, but between things getting WAY too hectic at work, and several musical and CD projects I owe to friends and aquaintences coming due at the same time (none of which I've finished, weeks later), I've not been paying attention to much of anything else. So, although these will be old news for some of the people who read this, but I've uploaded two sound manipulating tracks I worked on, last summer. The first is one of my "cut-up's", the likes of which I used to do, nearly to exhaustion, back in the early '80's, and just recently started doing again. This one started with a friend's suggestion that the English and German versions of "She Loves You" could be merged to create a new, interesting title phrase. The other is a mash-up featuring, as it's basic track, the original recording of "Yesterday", paired with bits and pieces of 16 other records, 15 of which are from the 1976-80 era, and therefore retitled "Now I Long For the the Late 1970's". See how many of these songs you can "spot"! Songs are posted, as always, to the gmail site linked above and to the left. Well, my mom's in the hospital, hopefully being discharged within days. She seems to be bouncing back like a champion, from a fairly major incident in the life of someone her age, and I'm so thankful for that, I can't even put it into words. Anyway, I thought I'd post something a bit different than what has been offered up until now, as a way to pay tribute to my mother for the wonderful job she's done, and continues to do, in that role, as well as her amazing gifts and talents as a singer, and as a thank you for the wonderful musical education I was afforded, in childhood. My mom is a soprano, with a history of singing and performance too long to go into here, but because of the wonders of home recording, available to those who chose to avail themselves of it (such as my parents), beginning in the 1950's, I have a treasure trove of recordings of just about everyone in my family, and particularly of my mother's singing. 1.) "Depuis Le Jour", possibly the most romantic operatic piece I've ever encountered - it gives me chills just about every time - heard here as recorded in the living room of my family's apartment, in 1954 (you can occaisionally hear the upstairs neighbors moving furniture around upstairs, in apparent dissatisfaction with the racket coming from below). 2.) Proch's "Air and Variations", an unbelievably demanding and beautiful composition which I loved to hear when I was five, and still love today. This recording, which unfortunately both skips a neat, understanded piano intro, and ends as the last note is fading, was recorded in my mother's vocal teacher's studio, in 1965. Hope this is to your liking. It's about as wonderful as it gets! While the rest of the musical world is paying tribute to John Lennon, on what would have been his 65th birthday, by remembering his music and his causes, and amongst all of the radio tributes, I thought I'd post a few tracks that are, perhaps, not getting the airplay that "Imagine", "Come Together", "Twist and Shout" and "Born in a Prison" have gotten today (well, maybe the same amount of airplay that "Born in a Prison" got, since I have my doubts that that one was heard by too many listeners). I'm a devotee of the "Get Back" tapes, the endless hours of recordings which captured virtually every moment that the Beatles were in the studio (or, for the first two weeks, the film set) in January of 1969. I know that for some people, these recordings are the perfect thing to encourage them to leave the room, but I have listened to them eagerly for years. At the Gmail site, there are three odd recordings from those sessions, and one rockin' version of a song that ended up on the "Let it Be" album. The song from "Let it Be" is "Two of Us", heard here in a slightly incomplete form, as an uptempo rocker, a much better setting, in my opinion, than the version which was released. Moving on to the true "outtakes"... The most well known is the improvised (and Lennon-led) song "Suzy's Parlour", a condensed version of which showed up in the film "Let it Be". This is the whole thing, though, in all it's ragged, loose glory. Second is a goofy series of performances that three apparently drunk Beatles performed, after returning from lunch on January 10th, and after George had announced he was quitting the band effective immediately. John riffs on "Don't Be Cruel", and then the three of them wander around with some Bossa Nova songs for a few minutes, with Paul offering some ridiculous vocalizing, and a few lines from Elvis songs, as well. I find this little segment endlessly entertaining. Finally is a song I might very well put in my top ten favorite Beatles songs, even though it was never released, and was, in fact, an improvisation. It's January 9th. George complains about the way the band is set up, and plays a few chords to demonstrate. Paul joins in on bass, continuing, even though George stops almost immediately, and leads the rest of the band into what becomes a rockin', if somewhat disjointed, song, a song poking very sarcastic fun at a politician, Enoch Powell, who was making news that week by making some extremely distasteful comments about Pakistani immigrants. The song is called "Commonwealth", and I'm posting it for John's birthday, even though it's Paul's improvisation, first because it's such a great little number, but also because John's addition to the song (the "Yes" shouts in the chorus, and a few other comments), help make the song much better, especially in that Paul cracks up a few times in response to John. (It is not, as some casual listeners have thought from time to time, proof that Paul holds racist views - he's clearly satirizing a racist.) I once wrote out the words to this song (as I heard them), including the points at which Paul mumbles gibberish, unable to think of a rhyme, and will happily send them out or post them, if anyone is interested. Hope that some of these, if not all of them, are new to you, and that you enjoy them. Happy birthday John, wherever you are. Here are a few comments about two tracks I've uploaded to the gmail site. I've been collecting song-poem records for nearly ten years now, and although my collecting had slowed to a crawl a couple of years ago, it is now going at full speed again, due to CDR trading and online buying. The songs I've uploaded are two of my favorites among my recent purchases. 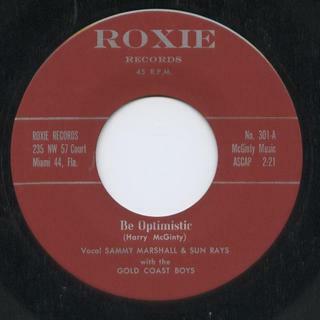 The first is "Be Optimistic" by Sammy Marshall and the Rays, on the "Roxie" label. 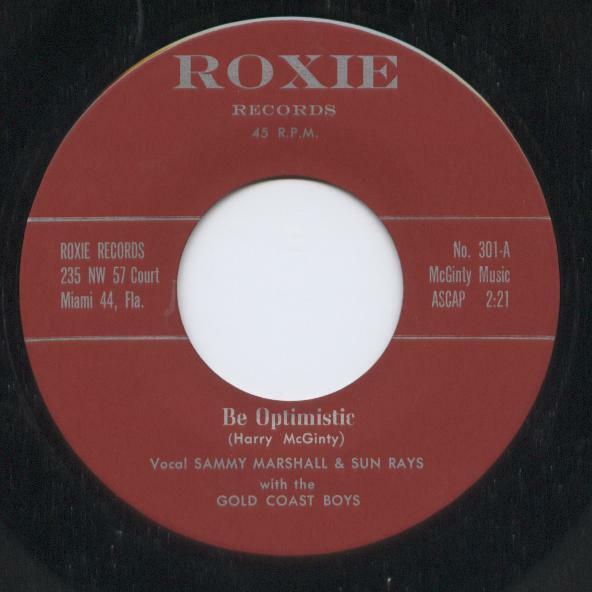 Following a short burst of the chorus, this song opens up with a line which has to be among the least likely lyrics one would ever imagine opening a song called "Be Optimistic". But I'll leave that surprise for you. In general, the song doesn't sustain that insanity level, but the main point of the song - which seems to be along the lines of "don't gamble, and don't believe in luck, but still, 'be optimistic' " - is muddled enough to make for a bizarre listening experience, especially since the singer barely describes anything good happening to you - prior to your arrival in heaven, that is. The other disk is my very first 78 rpm song-poem purchase. At least I assume it's a song-poem - it's on a label said to be dedicated to such releases, "Stylecraft". On the other hand, maybe it isn't a song-poem - it sounds fairly professional, if odd in lyric and subject. The song is "The Grinder Man", performed by Frankie Day. I love the arrangement, and I'd also love to know exactly what the lyric "...knives and shivs..." means, as I'm not aware of the difference between the two. Perhaps a kind reader/50's gang member out there can clarify this point for me. I'm just glad to own a smoothly sung, demo performance of a tin pan alley-ish song which contains the word "shiv". Hot off the turntable, it's a pair of fabulous recordings by Pinky Pinkston and the Dixie Drifters, two sides of the one 45. This has long been one of my favorite "way out there" record releases, one I've always figured to have been a vanity pressing, especially given the two addresses on the label, one in Chicago and one in rural Illinois. On the other hand, I've recently learned that there exists at least one other Pinky Pinkston release, one which has been anthologized in the past, in a collection put together by Wavy Gravy, of all people, so many Pinky had some sort of musical career. Such a concept is hard to fathom based on this record. This easily ranks at the bottom among the worst records in my collection (particularly when soul-challanged artistes as such Tony Martin, Fabian, Jay and the Americans, Benny Mardones, Yes, AC/DC and Billy Ocean are removed from consideration for "The Awfulness Awards", and are entered into the (sadly) far more competitive "Horrid But Successful Hitmakers Awards"). 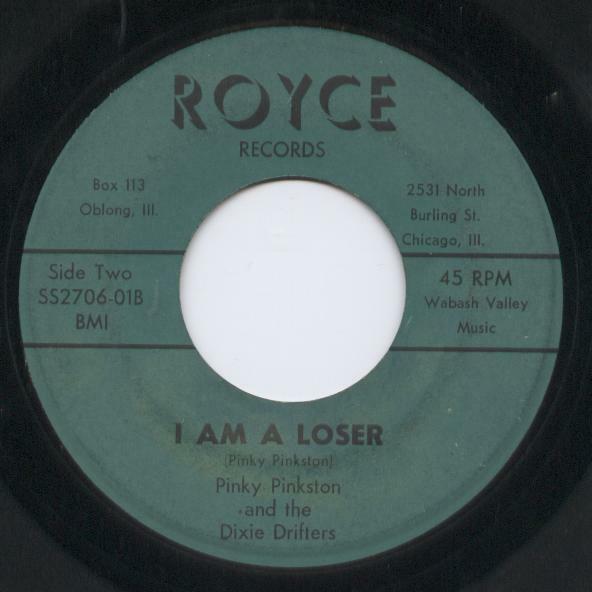 Yes, there are few obscure records in my collection which are more cringe inducing than Pinky's song "I Am A Loser", although one of the songs which is even worse is "Beggar Or A Clown", which is conveniently located on the other side of the record, and which also, just like "Loser", features a ferret being tortured, or perhaps that's Pinky's voice. I've yet to be able to make out every last word of these lyrics, due to the unique delivery of the lead singer. If my clock radio alarm were to switch on, and a radio station was playing either of these songs at that moment, I have no doubt whatsoever that I would be positively scared out of my wits. There's something to be said for the random way that the "I Am a Loser" starts up, and the way that the band members sometimes seem to be playing different songs at the same time, but it is on "Beggar or a Clown" where the true incompetence shows up. Once it gets going, in addition to the spectacularly bad vocal, every now and then, the drummer pounds a bit harder, as if he's suddenly playing a polka, and the guitar solo at the end seems to be made up of almost randomly picked notes. Then the song simply comes to a stop, first with the guitarist deciding he's done, then with the drummer offering a final downbeat. Perhaps you've noticed a lack of gender identification, on my part, for the Pinkster. Well, I was recently amused to discover, after years of enjoying this record with one of my oldest friends, that he (my friend) had always assumed that Pinky was of one particular (and marvelous) gender, while I had always thought of Pinky as the other (equally fabulous) gender. I'll let the readers/listeners have a bit of fun listening (I certainly shouldn't be the only one to have the rare chance to listen to this record any time I want), and offer up their guesses as to whether Pinky is/was a lady or a gentleman. Please do tell! I have no memory whatsoever of when or where it was that I came across this record, but given that the Chicago address on the label is not far from a highway I take every few days, the aforementioned friend and I went to that address one day, and found a rather upscale apartment in the Lincoln Park neighborhood, where the listing on the door did not show any sign of anyone named "Pinkston". Today, I've uploaded (to the gmail site) the contents of a little acetate I found somewhere or other about 15 years ago, a violin performance of "Dutch Dance", recorded in 1952 by one Walter Feiss (well, that's actually a guess - I suppose there could have been two Walter Feisses trading off phrases, but I doubt it). While I won't deny that this record is part of the "Difficult Listening Hour", I treasure anything like this record, whenever I'm lucky enough to come across one. I must have hundreds of home recorded records from the golden age of home record cutters (1940's and 1950's). Some of recordings of other records, many have recordings off of the radio, and many more (the ones I am really looking for) have some sort of home recording, either audio records or musical performances. For some reason, this one has always stood out as a favorite of mine. Let me know what you think. I love the music of the late '50's. As much as I love the Beatles and the music of the late sixties, as well as the music of my early adulthood (late '70's and early '80's), the pop and rock from the 1954-63 era is more enjoyable to me than that of any other 10 year period of the last 60 years. And one reason for that preference has to be records such as those made by Patience and Prudence. Patience and Prudence had just two hits, one of which, "Tonight You Belong to Me", would be high on my list of the best hit records ever. And yet, after years of finding other P & P records in used record stores, I discovered that a good percentage of their non-hits were almost as good as that lone top ten hit. An early favorite of mine, during that collecting binge, was "You Tattletale", which I discovered well over 20 years ago. More recently, with the release of a CD of virtually all of their recorded work, I've been enamored of "Over Here", as bizarre an attempt at 1950's hit making as you're likely to hear. While these tracks can probably no longer be considered "obscure", what with the CD release I mentioned, they are both certainly wonderful. "You Tattletale" deserved to be nearly as big of a hit as "Tonight, You Belong to Me", what with it's peppy piano, swinging brushes on the drums, and the wholly wonderful harmonies by Patience and Prudence McIntyre. The song itself is a great little piece of writing, too. "Over Here", on the other hand, defies explanation, except to say that it involved Ross Bagdasarian, which is perhaps all one has to know. The future David Seville co-wrote this beautiful train wreck of a song, and the only bad thing I can say about it is that the production values make the words hard to decipher. But there's a real treat waiting for those who listen closely: It's almost unreal to hear these 15 and 13 year old sisters singing sarcastic lyrics in which the "ridiculous" behaviors of a series of foreign cultures are played against the clearly more outlandish behaviors of Americans. a meal? Boy, I gotta finish this drink and get outta here - I sure hate this ulcer. All set to a rollicking arrangement, in which each verse's music reflects the culture they are supposedly dismissing. And this was supposed to be a hit? Couldn't be. But a killer track, nonetheless! Both tunes have been sent to the gmail site referenced above, as usual! 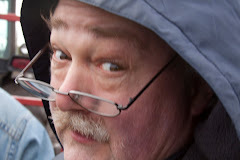 Per Michael's request, in response to my "listening list" a few weeks ago, I have posted several files to the gmail.com site which is linked to the left and above. Without a doubt, my favorite of this batch is "Jamaican Rhumba" by Percy Faith and his Orchestra, and here's a little story to go with that number, as well as "Jungle Fantasy". In late 1952, my dad bought one of the first reel to reel tape recorders which was on the market, a Concertone behemoth. The company was based in California, and when the machine arrived, it came with a reel of tape already on it. The tape contained five complete songs, all of them studio recordings, banded with leader between the tracks, plus a short accordian and tuba polka at the end of the tape, literally running out at the end of the tape. There was nothing written on the tape or the box. My parents recognized the singer on the first song on the tape as Doris Day, and also assumed this was an outtake, as she can be heard complaining about how she "goofed it up again" at the end. The other songs were unknown to anyone in the family. Two of them were Latin styled instrumentals, one was a rather horrid song, featuring a male vocal with chorus and orchestra, and one was a nice recording featuring a female singer and orchestra. I came into the world eight years later, and grew up with this tape, along with dozens of other, home recorded tapes, many of which predated my existence. I found the same fascination with this strange, intriguing studio recorded tape as my brother had before me, but neither of us ever learned anything more about it. My favorite tune on the tape was the first of the two latin numbers - this was undoubtably because it had the same melody as a song called 'Mango Walk", which was featured on one of my favorite kids 45's (a record of songs of many lands, in this case, Jamaica or Trinidad, I think). I mean, it was the exact same song, chorus and verse. Since I'd already grown up with some calypso music, that probably also made this one a favorite me, too. Flash forward to sometime in 2003 or 2004. During a conversation with my brother, we come to realize that the internet may be able to tell us something about what's on our tape. 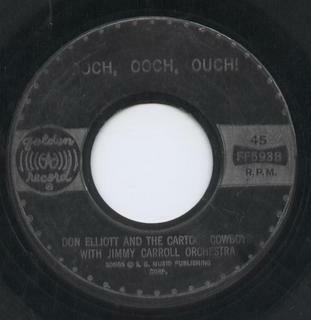 Very quickly, we're able to determine that all three of the vocal performances on our tape were released, perhaps in other versions, on the Columbia label, in 1952, one by Doris Day with Percy Faith, one by Guy Mitchell with Mitch Miller's orchestra, and one by Rosemary Clooney with Percy Faith! The two female releases were even hits in Billboard! Okay, so we thought, that leaves the instrumentals. What did Percy Faith release in 1952 or so. This took a little more time, but eventually, we discovered the titles of our two mystery songs, Jamaican Rhumba (that's the "Mango Walk" one), and "Jungle Fantasy". The following Christmas, my brother and I surprised each other when each of us gave the other the reissue of the Percy Faith album (from 1953) which contained those two recordings. We've even discovered that at least three of the five tracks on the tape have errors or differences from the released version (the accordian piece at the end has errors, too), making it likely that this was some sort of reel of "good but not perfect" takes from a Columbia recording session or sessions! And if that's not cool, I don't know what is! So anyway, I've uploaded both of those songs (from the released version - I'm keeping the outtake versions for myself), as well as a third song from the CD (Wow! Wow! Wow!) that I greatly enjoyed. While there are some of Percy Faith's hits that I enjoy, particularly "The Song from Moulin Rouge", most of his records are fairly sedate. This stuff, on the other hand, I find to be positively infectious (in the case of "Jamaican") and intense (in the case of "Jungle"). In addition to the Percy Faith songs, detailed above, I also uploaded two songs from 1960 and one from 1959. "Pineapple Princess" is goofy and cheesy, but it pulls me in with the stereotypical hawaiian arrangement, and a better than usual vocal from Annette. This is really the only record of hers that I love. "Bumble Bee" is the other end of the spectrum, a weird, almost spooky arrangement, far more poppy than I'd expect from Lavern Baker. I first heard this, many years ago, on a poorly recorded reel to reel tape of a poorly received AM radio broadcast. That could be the kiss of death, but what I heard through the muck intrigued me, and once I got a better copy, I was not disappointed. Hope any and all who are listening enjoy them! At the risk of making it appear that my idea of a "perfect record" has to involve what one might call "rural instruments" playing instrumental dance music (which is not the case), I'm here to write about and offer up for auditory perusal another of my choices for the "perfect record" record prize, another one whith involves rural instruments playing instrumental dance music. For me, this one dates back to the great Nordic Acoustic Dance Music craze of the late 1980's, which took place solely in my head and on my turntable, around that time - I had a bunch of favorites of this type 'round about then, and this was my favorite of all. 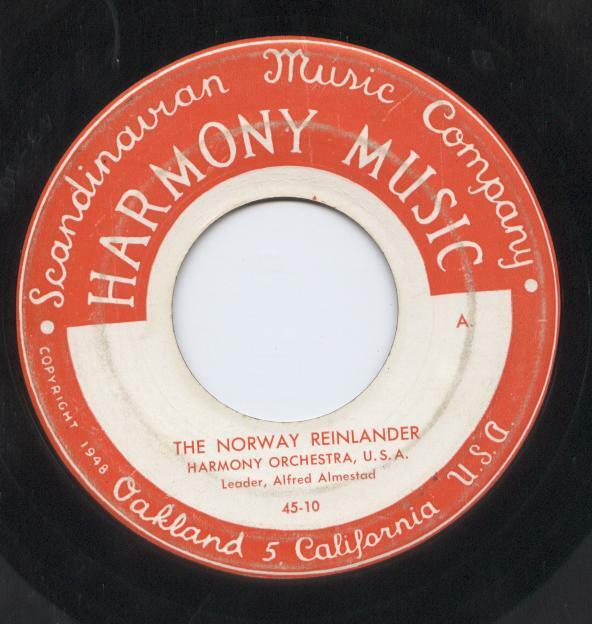 The record in question is "The Norway Reinlander" by "Harmony Orchestra USA (a group so named, one surmises, apparently to distinguish its august members from those in the similarly named "Harmony Orchestra Sierra Leone" and "Harmony Orchestra Tasmania"). 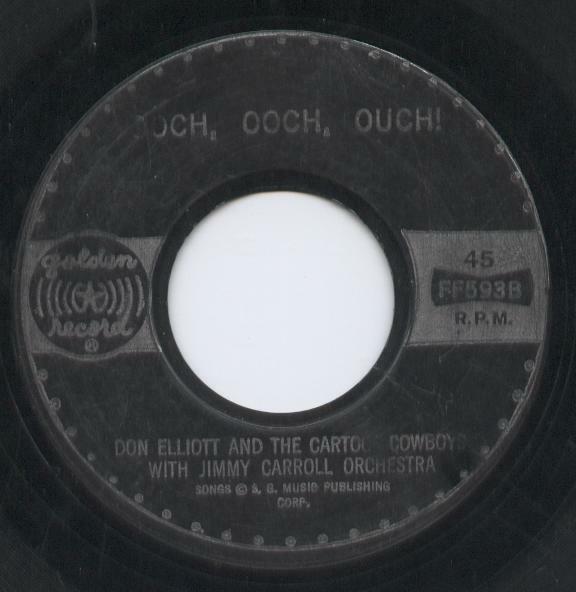 As you can see, above, the record is dated 1948, around the dawn of time for 45's, but perhaps it came out on 78 first. 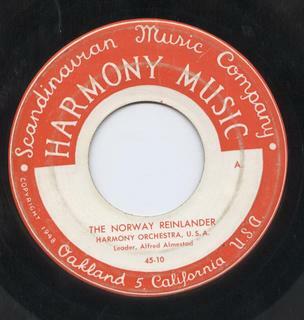 The leader of the group is named Alfred Almestad, perhaps the least suprising thing about a record that sounds like this. The record is, as always, posted at the gmail site linked to the left and above. What a glorious noise it is. A bit like a polka, a bit like something I'd expect to hear in Germany or Switzerland (or perhaps I'm just showing off my ignorance of those countries' folks music), and played with much more gusto than a lot of albums managed over the course of 45 minutes! I love the interplay of the various instruments here, and the way they variously complement each other - at one moment, the piano has the melody, at another run through of the same section, the violins or the accordian may be the primary instrument. There is a point near the end (about the 2:40 point) where the piano cuts through all the other instruments and can be heard playing the most basic of parts, far less of a part than it had been playing earlier, yet for that moment it is the key sound on the record. Guess I'm just strange, but I live for moments like that. The vibrato on the violins, in particular, when they play the sustained harmonies, gives them a wonderful, emotional feeling, and the interplay of the accordion and the piano throughout reminds me of the wonderful sound of the organ/piano duets heard on the earliest Bob and Ray shows, from around the same time as this record. But pulling this record apart doesn't do it any favors. This is celebratory, passionate music, surely reminiscent of the homeland in the title, one which causes me to think of the rural lands of northern Wisconsin that so many Nordic folks found similar to their homeland, and the home to a favorite town of mine, similarly named to part of the title of the song. It's got a melody I can whistle or hum to myself for days on end, with not a dead moment. Although the record seems like it's going to keep going and going, with yet another performance of one of its themes, when it's over, I wish it was still going and going. Just about the last place in the USA which I'd expect this record to be from is Oakland. For the first time in this forum, but certainly not the last: Today's item cannot be bought anywhere, and never could. In this case, it's even possible (though perhaps not all that likely) that I have the only original recordings of this song that exist. I have bought hundreds of home recorded reel to reel tapes over the years, containing every manner of recorded material - albums of classical, pop, country, MOR, jazz, etc., radio and TV broadcasts, college lectures, commercial demos, even studio rehearsal tapes. Then there are a whole bunch of family and personal recordings, generally my favorite type of material to find on a reel of tape. Today's song is also from this batch of tapes, and carries the unlikely title of "Head Cheese". It's available at the gmail site linked to the left and above. In fact, it was the words "Head Cheese", written on one of these boxes which caught my eye, during the sale at which I purchased these tapes. "What the Hell...." I think was a good approximation of my thoughts, at that moment. The brief version of the story of these tapes is that there were apparently a group of friends, most of them not professional musicians, who gathered together (perhaps much like my musical friends and I gather together from time to time), to make music, write, perform and/or record songs, between the early '50's and the early '60's. Whether these were just for personal enjoyment, or designed as demos for some (probably) failed attempt at selling their efforts, I don't know, but at least a half dozen people sing lead on the songs heard on these tapes, with varying styles of musical backing. The contents of the tapes (and there are about 6-8 of them) are, for the most part, very well documented on the tape boxes, and some songs are heard several times, while others are performed only once or twice. My favorite songs in this set of recordings are those sung in whole or in part by a young woman who was apparently the daughter (or at least a relative) of the one man in the group who was clearly a professional musician (others may have been, but I only know for sure that this one - Don Moreland - was). Her name was Marigail Moreland, and she sings a couple of songs, including "Reputation" and "Head Cheese", along with the adult musicians. While "Reputation" is simply a stellar song, fantastically arranged and unique in performance, "Head Cheese" is altogether goofy, maybe even stupid, a child's song in writing level and performance, rescued from the the doldrums of musical hell suggested by those terrifying words by the sheer exuberance of the lead singer, and the good fun that everyone involved seems to be having. I'd never say this is a great recording (there are several better, I suppose, even amongst these "Moreland" tapes), but it's a damn good time, and as with everything from these relaxed, friendly sessions, the love and enjoyment between participants comes through. And I just adore the singing of this young woman, who I know nothing about, except her name, and that (per the web) someone with the exact same, rather odd name, once worked on a 1960's Z-Movie, one which went on to be featured on MST3K. I'd certainly love to know where life took her. As I wrote in the title of this post, this is REALLY cheesy stuff, with lyrical phrases that were probably cliches by the time the song was recorded - February 6, 1954, according to the tape box - and a really corny conclusion to the song, and yet the song still runs around in my head from time to time, 10 years or more after I first heard it. "Have You Ever Tried to Get Rid of an Igloo" by "V'nectarines"
And now, the moment no one's been asking for, Bob's listening list for June. Last month's listening was heavily impacted by having gathered together some of the hits of 1960 for an upcoming poll I'll be doing for friends, as well as renewing my love of a few song-poems ("s-p"), and finally, getting around to listening to a very interesting Latin-American influenced Percy Faith album from 1953. 6.) My Heart is an Open Book - Carl Dobkins, Jr. So far, I've offered up records that, however odd they may be, I also find marvelous through and through - musically, emotionally, intangibly, etc. Several records from my childhood collection will no doubt make their way to this forum, and there were plenty of them that I thought were weird (and a few I considered scary), even in early childhood. But this was weirder than most of the others. For one thing, it's FIFTY FOUR SECONDS LONG!!! It's the whole side of the single, and it times out at well under a minute! I can literally see the spaces between the groove as it moves towards the center of the record. Just as odd is the performance of the song. First, there is the fact that (to me, at least), it sounds like we join the song in progress, almost in mid-breath of the singer, and certainly after some sort of music has already been played. Then there is the deeply weird lead vocal, the overly peppy chorus, singing in such jolly spirits about being conked on the head (I particularly like the happy way they sing "He's a grouch", which is repeated three times), and the wacky sound effects. Not unheard of in kids records, but the feel of this one is sort of different, and the sudden ending just makes it weirder. In addition, although the singer is presumably a cartoon character, singing about an occurance which is not uncommon for cartoon characters, I have no clue who he's supposed to be. Most of the kids records I've ever seen, if they are in character, have the name of that cartoon personality on the label, whether it's "Captain Kangaroo and Mr. Green Jeans sing..." or "Popeye Sings....". But this one is by "Don Elliot and the Cartoon Cowboys". This last point sent me, quite recently, for some answers. There is a famous Don Elliot, who is apparently primarily known as a jazz trumpet player, but who is also listed as a vocal talent in some searches, and was one of the hipsters behind the Chipmunks-meet-Bebop project "The Nutty Squirrels", in late 1959. So I'll assume this is the same guy. I don't have a long story to tell about this one. For one thing, I have no memory of where I got it, although I think it was around 1986 or so. And for another thing, I only have the vaguest of ideas of what is being sung about - I'm sure that, if I were to be able to learn the title of the song, it would be nothing similar to the title "Spring Song" with which I've labeled the recording. The first thing to say is that, perhaps more than anything else in music, I love the sound of children singing. The second is that this song, and others, proved to me that it wasn't necessary for me to understand what they were singing for me to love certain recordings of children singing. I can't seem to find this record right now, so I don't have a picture of the label. But the label of the 10" record this song comes from is written almost entirely in Russian, as are all of the songs on the album. None of the other songs stood out as anything I needed to hear more than a few times, but near the end of the second side, I heard this marvelous, chugging accordian (or whatever it is), with lower notes provided either by the same instrument or something else (it sounds almost like a pump organ), and I was immediately captivated. What a marvelous, unrestrained and inspired vocal. It is life-affirming, exciting and adorable, too, unihibited and wonderfully emotional. And then, just when that was getting really good, a whole chorus of like-minded, and like-voiced kids join in to sing a refrain, in each case made up of what I think is a part of each verse the soloist had just sung. That paragraph really sums it up. This is just a wonderful sound - three minutes or so of absolute exuberance, which I find completely intoxicating. As with the other posts, have a listen, at the gmail site linked at the left side of this screen (follow the sign-in instructions). I once had a friend take the song to a relative who spoke Russian, and she returned with a written description of what the song was about, rather than a translation. I no longer have that description, but as I recall, the song is about Spring in some unnamed town: courtship and other related happy, youthful Springtime experiences. Sounds like the right story for this music to me. I should have realized that there was room for confusion about the gmail.com site, as I did the same thing the first time I was sent there (by a friend of mine). You do not have to sign up for a gmail account (that requires an invitation from someone already on gmail). You only have to enter the username and the password, seen to the left on this screen. Make sure you capitalize both. So it was sometime in 1988, and my wife and I went to stay at her parent's house while they were out of town. While looking for something, I came across a rusty 78 holder/carrier. I would have been intrigued by a box full of records under any circumstances, but given that my in-laws had never given me the slightest impression that they had any particular strong musical tastes, I was particularly interested. My interest both grew and diminished when my wife mentioned that her parents had been into square dancing in their younger years, and that her father had been a caller. More interested, because this image in no way fit what I knew of them, but less interested because I'd heard a LOT of square dance records over the years, and had yet to be interested in any of them. What I wasn't counting on was the quality of the square dance records made in the 1940's. First, there was no "version with calls" on one side, and "version without calls" on the other. And second, there were real, greatly talented musicians on several of these records, playing a whole bunch of emotion-filled numbers, without a pedal steel guitar or picked fender bass in earshot. NO - these folks were playing their hearts out, on fiddle, double bass, acoustic guitar and piano, just as if they were backing up some backwoods country and western star on the next hit record. There were half a dozen records in that box which might eventually make an appearance here, but the standout, not only of that batch of records, but among my favorites among all the records I heard for the first time that year, was "Spanish Cavalier" by an outfit called "Harley Luse and the Blue Ridge Mountain Boys. Have a listen, or a download: it's at the "Bashleo" site linked to the left. I suppose someone could listen to this record and say "well, they're just playing the same durn thing over and over again", and in a way, they are. But it's so much more than that. For one thing, there are subtle differences between the choruses, like the way the pianist plays a descending figure to lead into the first chord change of the chorus at the 1:24 mark, the fact that the second chord (as played on the piano) is usually A minor but sometimes is C major, and the way the bass player suddenly starts playing more of a walking bassline near the end of the piece. I also love the very presence of the pianist, sort of unusual in this style of music, doubling the melody, and I particularly like the varying styles with which the violinist plays during the song, leading to a different feel for each verse. Even the pianist's little stumbles at a couple of points (such as at the 0:58 mark) endear this record to me (as certain friends of mine are aware, this sort of little imperfection often endears records to me....). So who was Harley Luse? I'd have to assume, based on his records, that he was the violinist on these records. A websearch turns up a couple of references to someone by that name, reporting him variously to be a drummer, an accordianist and an actor, as well as a few mentions of this group, with no specification beyond what I already know. I've managed to find a handful more records by Mr. Luse, including a killer find of five of his records all at once in a box of square dance records. That particular batch of records were promptly broken, before I had a chance to hear them, when one of my then-toddlers put down something large, knocking something else into those five records. 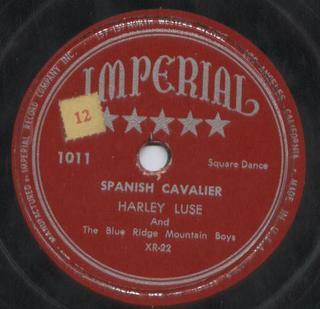 I've yet to find any more Harley Luse records. There is no one "perfect" record. My life is, among other things, a search for the next in a series of "perfect" records. Clearly this is one of them. "How about those piano mistakes? ", I hear someone asking. Well, perfection in performance has little, if anything to do with the perfect record, otherwise my search would end with such things as Mariah Carey and Yes albums, none of which reside in my house. A perfect record, to me, expresses a mood, captures an emotion, and maybe even tells the listener something about the performers, even when it has no words. I can listen to "Spanish Cavalier" by Harley and the boys a dozen times in a row without stopping, and have a pretty clear idea what it must have felt like to be in that room, playing or listening to this music, the sort of place where the people who invented this music lived and maybe even the sort of lives people in that area lived. Surely, I recognize that I could be wrong, but the beauty of this record is partly in that it convinces me so completely that I do know all those things, and when a record has that effect on me, it might be around that moment that I start thinking that I've found another "perfect" record. The log-in IS case sensitive. I chose this to be the initial record because it is one of my favorites, and a virtually unknown one at that, by Thurl Ravenscroft. I chose to start with Thurl because of his death, earlier this month, at age 91. 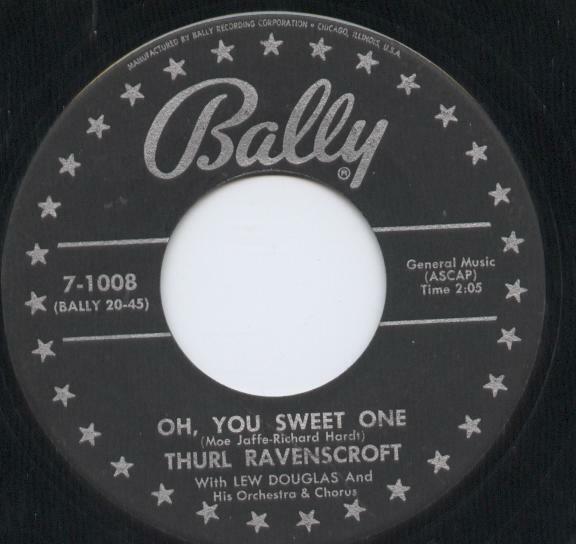 Thurl Ravenscroft is one of my musical heroes, and I began to collect his records about 23 years ago, after I learned a few facts about him. I began searching out his records more frequently after I the song "This Old House", a # 1 hit from 1954, sung by Rosemary Clooney, with an essential assist from Thurl on the choruses of the song. I had, of course, heard him since childhood, both as Tony the Tiger and in his performance of "You're a Mean One, Mr. Grinch". But around 1982, after hearing "This Old House", I quickly snapped up the many Walt Disney records on which Thurl appeared, a few Sesame Street records and even another couple of pop hits on which he appeared. Then, over the next twenty years, one by one I found a more intriguing batch of recordings, all of which appear to be from the mid '50's. Basically, it appears to me that at least a few record label people felt it was likely that Thurl Ravenscroft, middle aged basso profundo, was just the right person to become the next romantic balladeer and/or the ideal duet partner for romantic hit songs. Perhaps this was due to his appearance on that # 1 record, but whatever the logic, I'd say it was faulty. But regardless of the reasons, several labels released records by Thurl as a solo artist or duet partner. The first one of this sort I found, and a favorite of mine to this day, is "Oh, You Sweet One", released on Chicago's own Bally label. Here we have Thurl, singing a lightly romantic song, based (I believe) on a German folk tune, accompanied by the most exuberant backing singers a happy-go-lucky man could ever want to have along with him, as well as sliding trombones punctuating each verse. I find this wonderfully ridiculous - upon hearing the opening four part harmony trombones and four part backing warbling, the last thing I'd expect from a lead singer, particularly one who is going to ask "Isn't This a Lovely Day?" would be that it was someone singing in roughly the same range as a tubist. And yet, he makes it work, for me anyway, and like so many of the songs I will share here, I wish this was a song which had become a hit, and a fondly remembered oldie. Or, failing that, I'd have loved to be present at this recording session. And finding this record, and finding it so irrisistable, was the catalyst for my continued searching for Thurl records. Have a listen, if you please. Well, I've been encouraged to give this a try, and I think that's a good idea. My intention here is to write about some of the great, strange and/or unknown music and other sounds which I've come across, since I began collecting in earnest, perhaps 25 years ago (and Ernest wasn't too happy about that, either, by the way). With few exceptions, most of the sounds described here will be of the obscure or even unique variety. There will probably be a few big or small hit singles from the distant past thrown into the mix, but they'll be the exception. It's also my intent to provide a link to sound files for most of the sounds I write about here, and will provide that link (and a password) as soon as I've actually written my first post on the subject. I've started thinking about some of the recordings, and will begin with a timely entry, some time this weekend. I'm not sure how often time, other responsibilities and other projects will allow me to offer up new posts/sounds, but I'm hoping to find that time relatively often. I hope you find something to enjoy here.